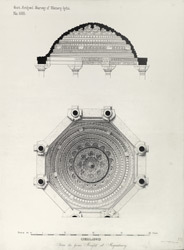 Pen-and-ink drawing of the ceiling of the Jami masjid at Kapadvanj near Ahmedabad in Gujarat, by an anonymous draughtsman, dating to between 1884 and 1886. This image is from the Burgess collection, an album of 49 drawings of plans, sections, elevations, sculpture and architectural details of Muslim monuments in Ahmadabad and the surrounding areas, made between 1884 and 1886. The drawings were prepared mainly by Indian draftsmen under the supervision of James Burgess (1832-1916). Burgess was in India from 1855 to 1889. He served as the Archaeological Surveyor and Reporter for Western India between 1874 and 1880, with South India added from 1881 to 1885, before becoming the Director General of the Archaeological Survey of India in 1886 until his retirement in 1889.